After making these bird's nest cupcakes with speckled egg cookie toppers last year, I couldn't get speckled eggs off my brain. They are really so simple...and so much FUN to make! One: Mini cookies are a lot harder to resist eating. Don't say I didn't warn you. Two: Flicking the food coloring, it's fun. It's so much fun that you should do it when your kids are at school...or where they can't see you. Otherwise, I see food coloring being flicked all over your house. 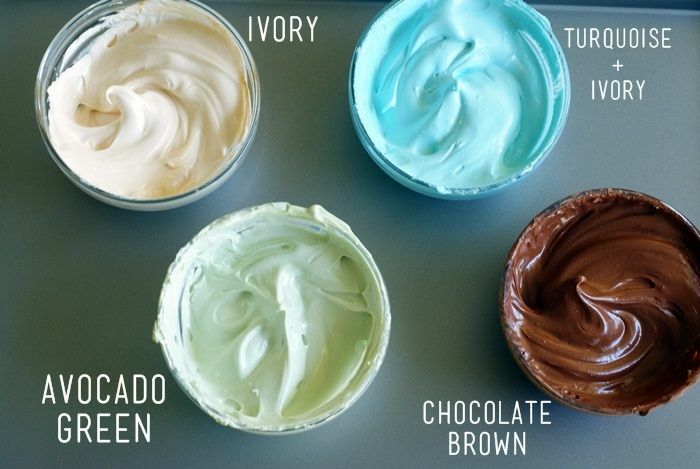 Thin the ivory, green, and turquoise icings with water, a bit at a time, stirring with a silicone spatula, until it is the consistency of a thick syrup. You'll want to drop a "ribbon" of icing back into the bowl and have it disappear in a count of "one thousand one, one thousand two." Four is too thick, one is too thin. Count of 2-3 is good. Cover with a damp dishcloth and let sit for several minutes. 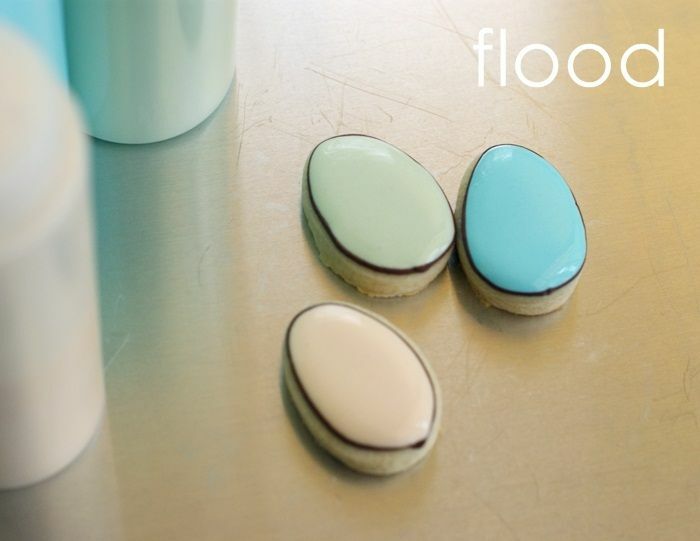 Flood the cookies with the colors, using a toothpick to guide to edges and pop large air bubbles. Let the cookies dry uncovered, 6-8 hours or overnight. The next day, place all of the cookies close together on a cookie sheet. 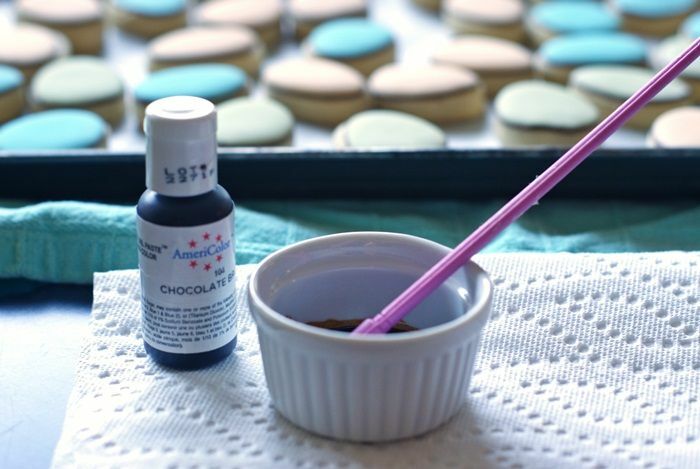 Mix a few drops of chocolate brown food coloring with a few drops of water in a small ramekin. Put on your glove...I learned from last year. Dip the paintbrush in the food coloring mixture, and with one finger, flick it onto the cookies. Rotate the cookie sheet every so often to get all of the cookies. Let the reserved brown icing come to room temperature. Use a #1 or a #15 star tip to add details onto the speckled cookies. 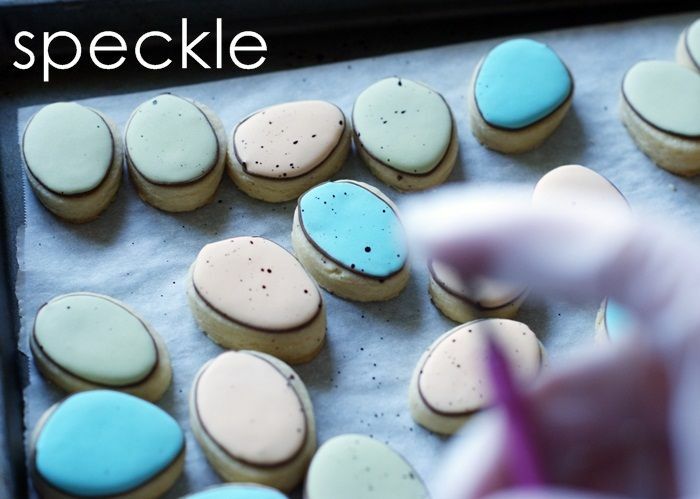 Speckled Egg Cookies...don't you want to try?!? I loved them last year, and love them even more this year, so cute! So cute! I just love your cookies ideas Bridget! These are adorable! 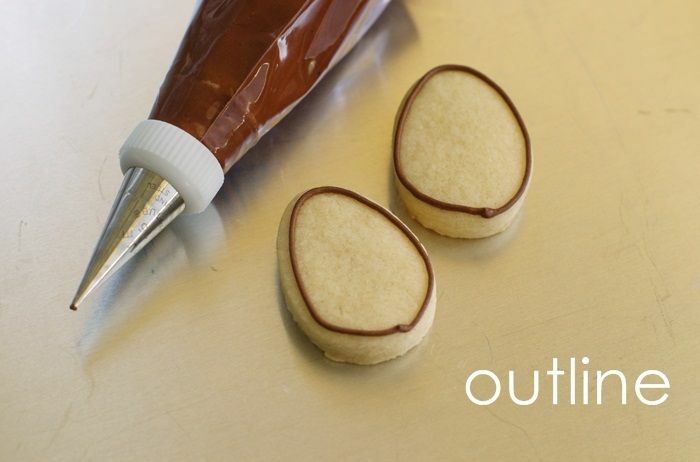 I don't decorate a lot of cookies, but these just might be a changing point for me! 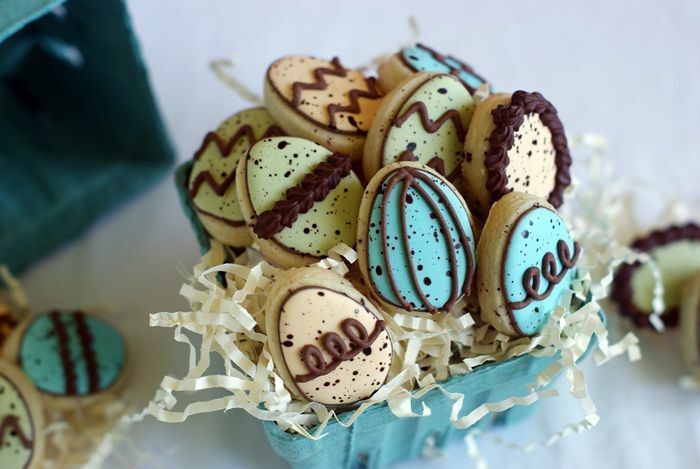 These are by far the cutest easter cookies I have seen. LOVE these! Just darling once again! Yeah... I wish I had more days of being a laid back Mom..we are works in progress. Thanks for always sharing your yummy details. I need to make someday..today and order some coloring and tips and get my baking on! Beautiful, I am silent reader of your blog, finally give up and showed my face. Admire your decorating skills. I need to try . Those are adorable! I think I will make them for the Easter Bake Sale. I'll def. need those cute little baskets. Thank you so much for the step by step how tos. You have inspired me to take on cookie making and selling! I'm excited and have been very busy already. 160 Dr. Suess Cookies for Read Across America Day! So thanks again. Sometimes when I get an order, I think, I don't know if I can do that cookie. I need to look on Bake at 350 to see if she has showed us how! I made your cowboy boot cookies for Western Day at my daughters school. Again, Thank you SO much! You are awesome. These are so cute! I love the colors you chose. :) Thank you for the step-by-step. Will definitely have to try this. If these aren't the epitome of Easter Preciousness I don't know what is!! Oh so sweet....love the colors, Bridget! What a perfect little gift those baskets full of cookies would make!!!! Thanks for the tutorial!! Absolutamente adorables. Gracias por el tutorial. These are the freakin' most adorable things EVER. These are so beautiful! I love the pastel shades of the icings and your photos are so good! Every time I look at your blog you make me think I could be a pro cookie decorator in no time but I'm sure it's not as easy as you make it look!! I remember your cupcake bird's nest post and the speckled eggs. This baskets of eggs are really cute. Speckling for the kids would be a blast...with a big plastic sheet covering everything other than the cookies! No, I don't want to try.. I want to eat them ALL! All the cookies!! You make the most adorable cookies! Ree needs to have you over for another decorating lesson contest and I need to win!!! These are so pretty! I LOVE LOVE LOVE the colors you chose! Love these eggs! And the soft colors you chose are beautiful! Easter just has the cutest food!! These are adorable. Love the colors! 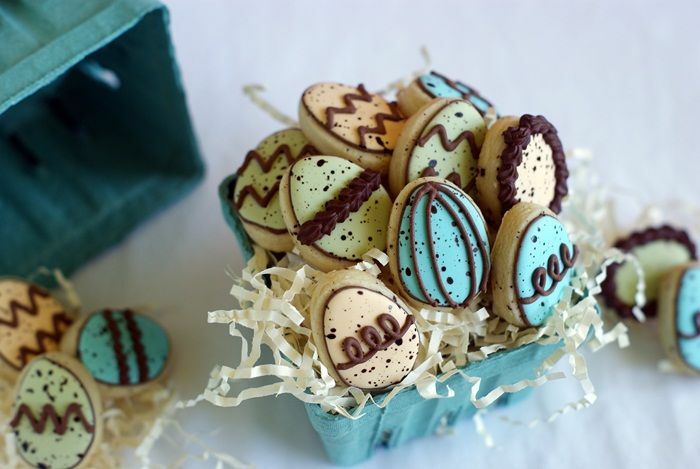 Mini eggs are my favourite easter eggs so I LOVE the idea of these in cookie form. So cute! Sorry for *yelling* but...I. Die. Birds and eggs and nests? I J'adore. You've outdone yourself this time sweet peach! 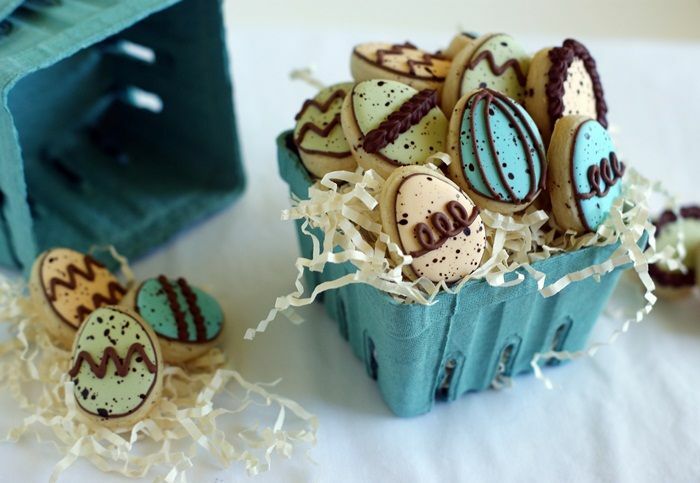 Chocolate speckled eggs are one of the few Easter candies I can't resist...love these! I'm completely stunned by your cookies. I have always enjoyed baking but have never been very good at decorating, but your step by step insructions make a decoration-phobe person such as myself want to run to the nearest store and buy food coloring! Your cookies look tasty and are just adorable! They also look like they are a blast to make. SUPER impressed over here, I am! So exquisite. You are so completely talented. I'll try my hand at these, but I'm pretty sure they won't come out looking anything like yours, lol. I love these eggies! Can you come to my house and help me?! I LOOOOOVE these! I'm only a laid-back mom part time. For this, I'm definitely uptight because my toddler would definitely start flicking every piece of food from then on out. ;) Anyhow, these are gorgeous! These are so cute! I borrowed a picture from this post, because this cookies are just too lovley to not talk about them! I looooove your Blog, thanks for all those wonderfull ideas!!! GORGEOUS job, as per usual. Bridget, these are wonderful, and exactly what I was looking for. Thanks for the tutorial and for sharing with us all. These are the best looking cookies I have ever seen. Gorgeous!!! I am oh so very hooked on making minis... for wedding and baby showers, for birthday party favors, for every holiday and the weeks in between. Too much fun and, YES, very hard to resist. I just tripped across your website and can't stop staring (okay, drooling) at your beautiful creations. You're very talented and I can't wait to read more. The colors and the details are perfect and so pretty! I adore the minis! You always have the cutest ideas B! I need to make some cookies again, it's been a while. Mini's sound like a great idea! These are adorable! I never have the patience to sit down and decorate cookies. I have a few times but I really admire your patience and attention to detail! I love how dynamic the speckled effect makes them look. Soooo cute. Mini cookies are more tempting to eat. Less guilt, but I wouldn't be able to stop at just one. These are super cute! These are gorgeous. Still not sure I could pull off making these, but I'd love to try. These are crazy adorable! LOVE them! And love how they are look in the berry basket. We always used tooth brushes to fleck the "paint" on. It works amazing, and it goes much quicker. Those are amazing. I am not proficient in royal icing, however I am thinking I may need to give it a try! I took these babies on, but I did big eggs to hand out at an Easter Egg Hunt. This is the first time I have decorated cookies (other than sprinkles) so I have a couple of questions: How thick did you roll the dough? How much Chocolate Brown did you add to the icing (mine never got really dark)? My flooding looks bumpy because I think it sank in some spots. What is the fix to this? Thanks! Thanks Bridget! One more question... should the royal icing that was flooded become hard or should it still be a little soft? 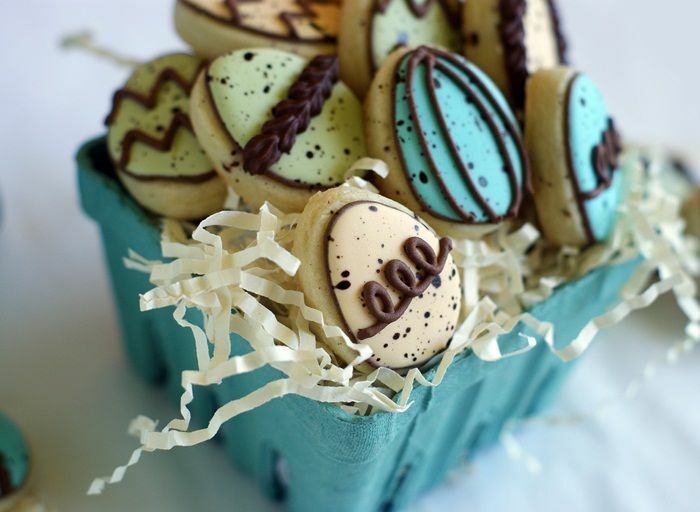 This mini egg cookies looks so lovely. Wren...look right above the picture of the icing colors. There is a link. You can also use any of the cut-out cookie recipes in the "recipe index" up top. :) Happy baking! Te felicito por tu blog y por estas galletas tan originales. Me han gustado mucho. These are SOOOO cute!! I just adore them Bridget! So cute! Where do you find the container? 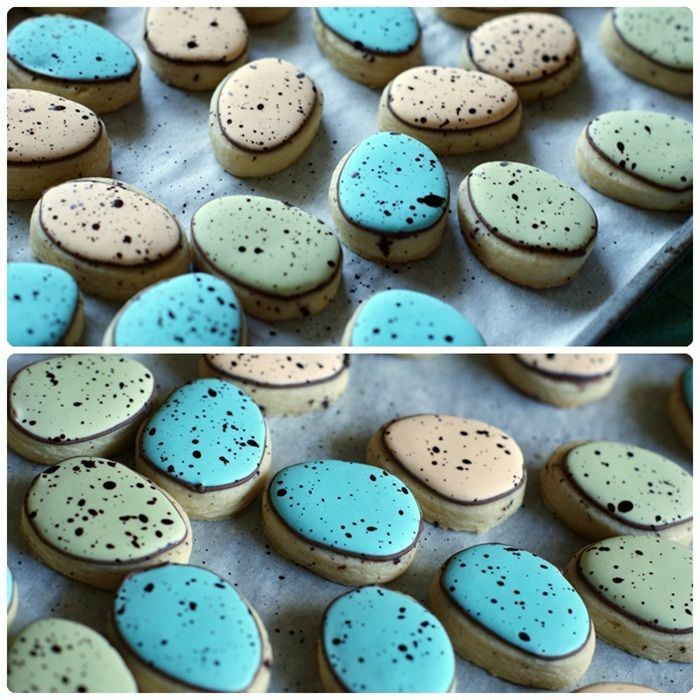 I just love the speckles on these adorable cookies! Absolutely too cute!! These are beyond adorable, perfect for Easter! So excited I found your AMAZING blog! Cheers! yes I do! Those are so cute!!! Love it when you nestle cookies in the little produce cartons. I know these little speckled eggs are the perfect~yuMMy bite! hi there! where can i order your cookies? TIA! These were the inspiration for a batch of speckled dino egg cake pops I did for a friend's 3 year old son's birthday! Thank you so much!